My skydiving career did not get off to the smoothest of starts. In 2009 I made a tandem skydive, something I had always wanted to experience. When I landed I realised that I wanted more than to be a passenger, I immediately started saving for my AFF. Beginning my course in 2010, I progressed slowly, I could only afford a couple jumps each month. 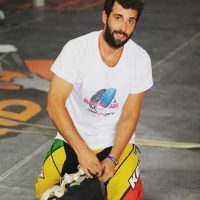 In 2013, I had my A licence and was enjoying the Madrid summer by making skydives with others. On the morning of June 21st, I made my way to the dropzone for jump number 40. Then I woke up in hospital. I had no idea how I’d got to the hospital, I lost all memories of that day and they have never returned. It transpired that I had been in a high-speed freefall collision and knocked unconscious. The skydiver who collided with me had suffered only bruises, he was able to provide an account and his video of what happened. The jump had been a 7-way “speedstar” with a 4-way base and the rest of us diving, myself fifth out (first diver). A typical new skydiver fun jump. As you can see in the video, the last two skydivers left a long delay. The last man out (video POV) dove hard at the formation and had caught me before he could react, neither of us saw it coming. The force of the collision was massive, I was knocked out instantly. Had the collision been full-body, and not a leg-to-head clip, I doubt I would have survived. I was wearing a DZ-owned student rig, fitted with a CYPRES and a large reserve. I was found in a field off the dropzone, which was, fortunately, free of hazards. 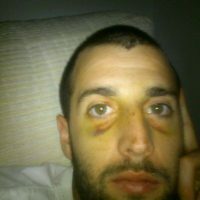 I’d suffered a considerable concussion from the impact, and a broken nose on landing, but no lasting injury. A concussion, two black eyes and a broken nose, but happy to be alive. My accident was on a Friday, and by Sunday I was back at work in a bread factory, I was badly concussed for a month and the period is a bit foggy. As it cleared, my job gave me time to reflect on what happened. How lucky I had been to land in an open field, and not on the hangar or on the highway. How grateful I was for CYPRES. I thought about skydiving and whether to return, and what to do with my life, the bread factory was not my long-term plan. There was only one way to know about skydiving. Two months’ post-collision, fully recovered, I returned to my dropzone and skydived again – I still loved it. Time went on and I continued to jump as often as I was able, which was occasionally. The more I reflected, the more I felt like my CYPRES save was my second chance. A reminder that life was a gift and to be made the most of. I would now often say “each day is a blessing to me”. I began thinking about how to get the most positivity out of what happened, how to change my life for the better. There had to be no regrets. I must live in the moment. I needed passion for life and to do what I love. Before my accident, working in skydiving had occurred to me, when I returned to skydiving, I knew I wanted it. By May 2016, I had 100 jumps and some savings. I quit my job to work on the dropzone as a camera flyer and progress towards my USPA ratings. Life began to change fast. Having so far done less than 20 jumps per year, in 2016 I made over 420. 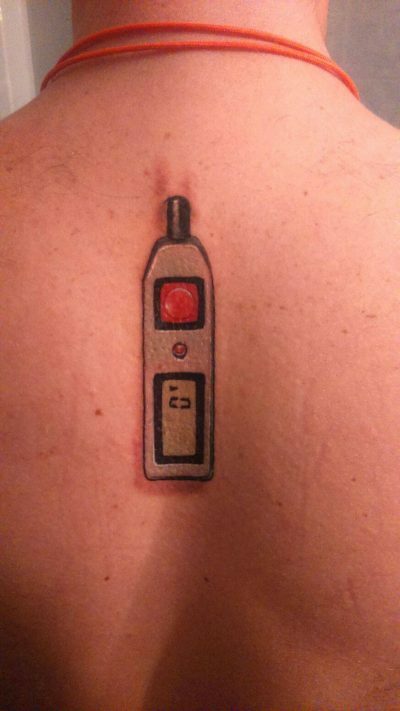 In recognition of the results of my new mindset, my friend who is a very talented tattoo artist offered me a gift – a memento of the device that saved my life. Continuing with my new mindset to pursue opportunities and fulfil my ambitions and passions, I started a conversation with Hurricane Factory. Following that conversation, this year I began my training as a tunnel instructor. I love every working day. At the beginning of this journey, if somebody had told me I’d be a tunnel instructor and professional camera flyer by now, I wouldn’t have believed them. The drive to live better pushes me, it’s got me this far and I’m excited to see what is next. Another silver lining of my accident has been the development of an unlikely friendship with the skydiver who collided with me. We had only met that morning. He had just 120 jumps himself and he felt awful about hitting me, but accidents happen. We have since become close, and the collision is our in-joke. As more experienced skydivers, we can now recognise that maybe the jump was poorly thought out for the abilities and currency of the participants. He is now a tunnel instructor too and works at the DZ as an AFF instructor and tandem videographer. We work and skydive together, but we also travel and scuba dive. We are like brothers. When you start in a sport like skydiving, you know what can happen. You accept the risk. It doesn’t matter who is at fault. Collisions happen not because of bad intention, just inexperience or poor momentary choices. That’s why we need backups. It’s why I needed CYPRES.